Generally the 21CN WBC platform operated by BT Wholesale that has been rolled out over a number of years has been vastly superior to the old ATM based network, but for some weeks now there has been a growing number of people complaining of peak time congestion issues. One of the most worrying comments to come out of BT Wholesale has been the level of packet loss that is considered acceptable within BT Wholesale, which is a massive 3% and this is actual packet loss apparently not just packets delayed for 500ms. The problem appears to be affecting multiple broadband providers, and is not consistent across the United Kingdom. We all know that broadband usage is climbing rapidly as more people switch to OTT TV platforms for their viewing, but as the billing on the WBC network is based around the peak utilisation it is in the interest of BT Wholesale to carry as much traffic as possible, rather than allow congestion. 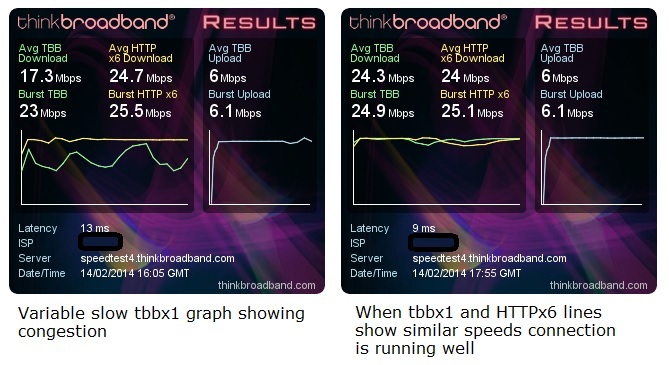 Spotting congestion is fairly easy using our speed test, which carries out a single thread test that can reveal widely varying speeds when a line is affected by congestion or if your TCP RWIN value is holding back your connection (seen as a slow ramp to a maximum speed). Low levels of congestion should not affect the HTTPx6 test, which uses six threads to try and overcome any congestion, but when congestion is bad this may start to vary in speed over time too. Another tool is our broadband quality monitor tool, and the above graph is from Saturday 15th and the connection was actually idle for the whole day (just 0.2GB of data usage recorded). This shows packet loss creeping in at peak times (red lines at top of graph) and an unusual pattern for maximum latency that seems to suddenly correct itself (yellow spikes). BT Wholesale continues to invest in adding new capacity to its next generation broadband network to meet the growing bandwidth requirements of its communications provider customers and their broadband users. According to Ofcom's measures, our network performs strongly in terms of throughput and minimising packet loss, jitter and delay. However, we recently encountered some technical issues along the way when rolling out extra capacity. This may be affecting network performance for some ISPs across a small number of exchanges. We have planned fixes in place for these issues and whilst some will be resolved very rapidly, others are more complex and may take longer to fix. We continue to work hard to fully resolve these problems. In the meantime, we would urge communications providers to contact us should they have any concerns around bandwidth and network performance." Very useful, both in terms of assisting with spotting congestion, and in terms of spotting people who appear to mistake a saturated line with congestion, or need some attention. Is this really a BTW overall platform problem, or is it that ISPs are not buying sufficient bandwidth from BTW? 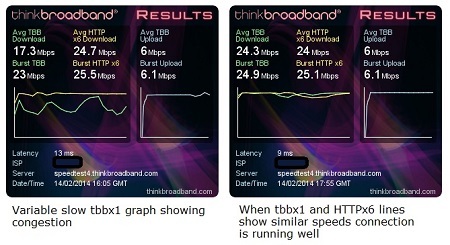 What does it indicate when the tbbx1 line is more or less straight and line speed, whilst the httpx6 line is about half as fast and all over the place? It's been a puzzle for a long time. If the tbbx1 is stuck at 12 Mbps and its OSX then a flash implementation issue. Best to post the link, as what one person calls flat is wobbly line to some. Could be flash (3rd graph looks anomalous,) but I suspect the BRAS. The router has been tested to much a higher throughput, but the effect is the same with a HH4 in any case, and on other PCs too... The most interesting clue to me is that this current bout of congestion seems to bring the graph lines together. No need to use tinyurl you can copy/paste the URL given on the page it reveals nothing private about you. Looks more like a software issue most of the time. OK, cheers, I'll take a look. The URL shortener (and clipped grammar) was just because I ran out of characters in the comment with the full ones! Looks like you could be right about the software issue, Andrew. Thanks for the insight into an age-old mystery, anyway. Suspect if we just published the figures no-one would be any the wiser to the variations over time that different things create. Suspect you're correct in that suspicion! Well.. do you really think your gonna get a dedicated 75mbps for £30 per month??? Somethings gotta give out some time :-) The math just don't add up!! Lacking sufficient nous, I don't really know whether or not something has to give at that price point. Very likely still a software issue rather than congestion, since the tbbx1 line is so flat, but I'm not wholly sure yet whether my comment is "Congestion? What congestion?" or "This congestion is terrible!" I've never seen a graph that looked even remotely that flat! andrew please reveal the isp's affected, as the reprots seem centered around plusnet with the exception of ignition who says he has it also on BT retail, but I cant find any other BT retail, zen etc. AAISP have on their blogs but their indiciations are it isnt anywhere near as widespread as it is on plusnet.